It’s one thing to be talented enough to create a short story. It’s another thing to be persuasive enough to convince about 2,000 people to get one word from your story tattooed on his or her body. 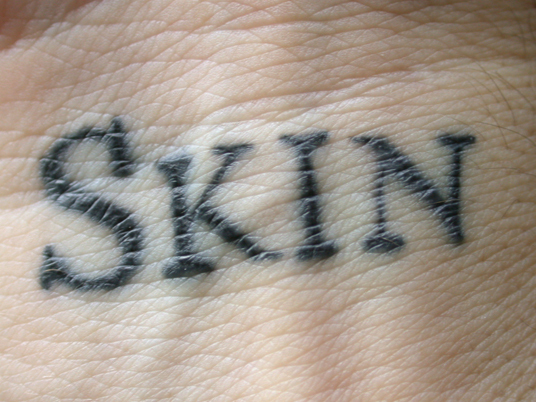 That’s what writer Shelley Jackson managed to do back in 2003 for her project entitled Skin. Getting inked for an art project has to at least be smarter than getting your gang affiliation tattooed on your face and less morbid than getting the ashes of your dead son turned into ink for your tat. Each participant received a single word from the story. Some of them also had, in addition to their lone word, a bit of punctuation such as a comma or period. The participants could get the tattoo on any part of their body unless their word was the name of a body part. In that case, they could not get the word inked onto that space. Once the tattoo was in place, a photo was to be taken and sent to the author. Since then, Jackson has taken the words she used before and come up with more tales to tell. However this time, the participants tell it verbally as well as with their skin. She compiled a video of some of her previous participants saying the word that is now a permanent part of their body and spliced them together to form a new story.